In recent years, much has been made of connected learning, and of new media’s power to expose students to new ideas, perspectives, and communities of thought. But what about those students given few opportunities to see beyond their own backyards, or for whom the 24-hour media cycle can seem like a relentless onslaught of violence, negativity, and stereotyping? How can we as educators use the tools of connected learning to empower students to take their stories into their own hands and speak out on behalf of the places and people they call home? This was the core question posed by The 524 Project, a dynamic collaboration between arts educators in Washington, DC and Detroit. Inspired by a 2009 TED Talk given by novelist Chimamanda Ngozi Adichie on “the danger of a single story,” DC-based Young Playwrights’ Theater (YPT) and Detroit-based InsideOut Literary Arts Project (iO) developed a hybrid curriculum of spoken word poetry, playwriting, and media arts that empowered our students to challenge the mainstream culture’s prevailing narratives about their cities. We called the program The 524 Project, after the 524 miles between DC and Detroit, and in the spring of 2014 we taught it simultaneously to a class at Ballou Senior High School in southeast DC and a class at Western International High School in southwest Detroit. Over the course of 12 weeks, 524 Project students explored the local histories of their own city as well as the other city, sharing insights into their lives that mass media often overlooks. 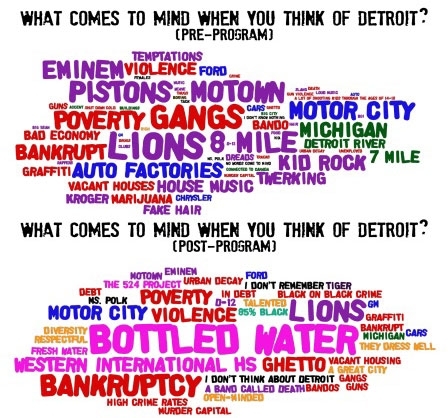 Through creative writing prompts like I Am [City Name] and City-to-City Love Letters, students in both Detroit and DC had the opportunity to counter narratives of poverty, bankruptcy, and government ineptitude with stories of the beauty and hope they see around them. The centerpiece of The 524 Project, however, was the technological integration. When the program began, each class was given an iPad outfitted with video-recording equipment and the free teleconferencing platform Google Hangouts. Every week, students in both cities filmed themselves performing poems and scenes, and then came together for a short “live exchange” in which they met each other in real time and learned more about the worlds of their counterparts. Through these live exchanges, 524 Project students revealed the stories beneath the headlines, exploring topics such as water bottling in the Great Lakes and conspiracy theories about the secrets hidden in our dollar bills. Question: What comes to mind when you think of each city? Divide the class into research teams. Each team chooses one word/idea/story from each list to explore further. Find and add at least one new piece of information to the word/idea/story that your Team selected. Find a creative way to share this information in a one-minute performance. Are there words or ideas on the partner classroom’s list for their city that resonate with you or make you curious to learn more? Are there words or stories on the partner classroom’s list for your city that you disagree with or find to be misconceptions? What might you clarify or add, and how would you do that? As a group, students compose and film a response to the other class’ word lists. They follow up with more information. When all was said and done, students in both Detroit and DC wrote powerful pieces from the points of view of their cities. The only thing that remained was to share those stories with the world—once again, collaboration and accessible media technology made that possible. 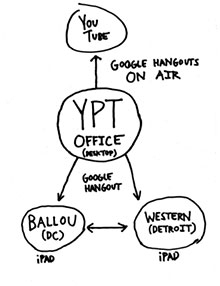 In late May 2014, the 524 Project students and their communities gathered in both Detroit and DC for a simultaneous, live-streamed final presentation. Alternating between live and recorded vignettes from both cities, the presentation wove a tapestry of student voices that spread not only through two rooms, but across the world via YouTube. The presentation culminated in a live Google Hangout between the students, which—in a moment of exultant spontaneity—evolved into a virtual dance-off for the ages. As two groups of students who may never meet in person erupted into peals of laughter, we knew we had found something magical. The work, surely, is far from done. The technology in our hands holds promise that we have only begun to tap. But our hope is that we have developed a model that others can replicate, bringing together young people from across the country and the world. That’s why we documented the whole process on our Tumblr blog, and why we’re sharing it with you now—because we want you to make this project your own, make it better, and give even more young people the chance to speak out on behalf of the world that they see.